Use this page to help you find a good hotel in Bergamo and the surrounding area, or to book a stay in other destinations featured on this website. Where I have personal experience of staying in a hotel it is marked *Best of Bergamo recommended*. Best of Bergamo has partnerships with several of the best-known and trusted hotel booking websites, to which you will be taken by clicking on the links that follow the hotel descriptions. In a superb location just off Piazza Vecchia on the right hand side of Via Colleoni, the Hotel Piazza Vecchia is located in a 13th century house. The hotel has retained many of the building’s original features and wooden beams. Each room contains a copy of a famous impressionist painting executed by landlady Tiziana De Franceschi and all the rooms are furnished in a contemporary style with smart bathrooms. The Hotel Piazza Vecchia’s website has an extensive photo gallery showcasing the décor and furnishings of its rooms. GombitHotel in Via Mario Lupo is next to the 12th century Gombito Tower in the heart of the oldest part of the Città Alta, only a short walk from Piazza Vecchia. Despite its stone façade, GombitHotel has a bright, modern décor and is furnished in contemporary style with modern furniture and works of art. There are 13 rooms on four floors, all with air conditioning, minibar, satellite television and free wifi internet connection. Just outside the walls of the Città Alta (upper town), Il Gourmet Ristorante Hotel offers guests a convenient yet peaceful location with stunning views from the terrace and many of the guest rooms. It is a short walk from Porta Sant’Agostino, one of the gates into the medieval Città Alta. It is close to the station for the funicular to San Vigilio and is also near Via Borgo Canale, the street with the house where Bergamo composer Gaetano Donizetti was born. The terminus of the bus route to the Città Bassa (lower town), the railway station and Bergamo Caravaggio Airport at Orio al Serio is nearby and there is also ample parking for guests with cars. As the name implies, Il Gourmet prides itself on the meals served in its restaurant, which offers Bergamo specialities and Mediterranean cuisine. You can dine either on the terrace with panoramic views over Bergamo or in Il Gourmet’s smart dining room. Il Gourmet’s building dates back to the 17th century when it was once a private residence. It was converted to a hotel at the beginning of the 19th century. It has nine double rooms, one single and an independent apartment with two double bedrooms, a sitting room and a private terrace. The rooms all have air conditioning, a fridge bar and satellite television. The smart, modern Hotel Piemontese is in a handy location opposite the railway station in Piazzale Marconi. Guests can get straight on to local buses that leave from outside the railway station or from stops at the beginning of Viale Papa Giovanni XXIII, but the hotel is within comfortable walking distance of the shops, bars and restaurants of the Città Bassa. 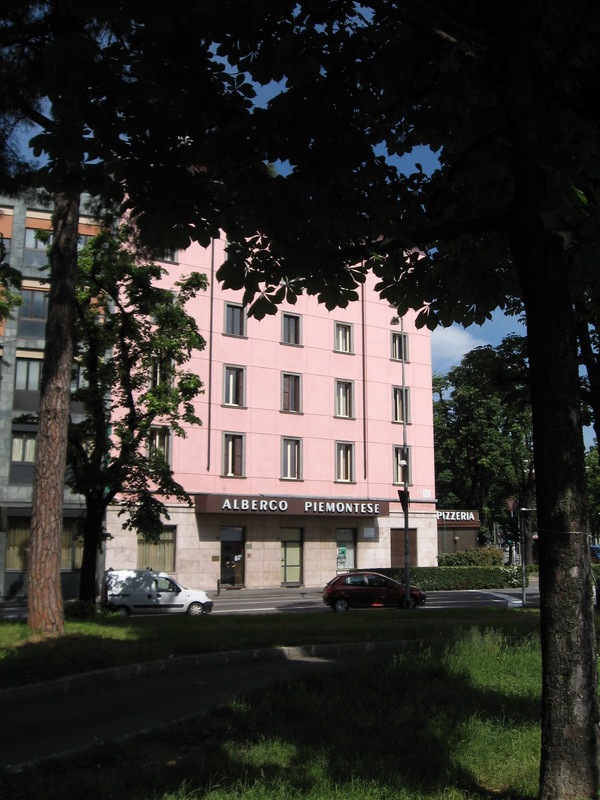 The Hotel Piemontese has 50 rooms served by a lift, all with telephone, satellite television and wi fi connection. A generous buffet breakfast is served in the large breakfast room on the lower ground floor. What was once an old inn in the Città Bassa is now a stylish Best Western hotel with every modern comfort. The Hotel Cappello d’Oro in Viale Papa Giovanni XXIII provides elegant accommodation close to shops, bars, restaurants and transport links. The spacious reception area has a marble floor, white statues and potted palms. The rooms are well decorated with immaculate, well laid out bathrooms. An extensive buffet breakfast is served in the hotel’s Antico Ristorante del Moro, which also offers a lunch and dinner menu, including traditional Bergamo dishes. All 89 rooms have wifi connection and there is a computer near reception free of charge for the use of guests. 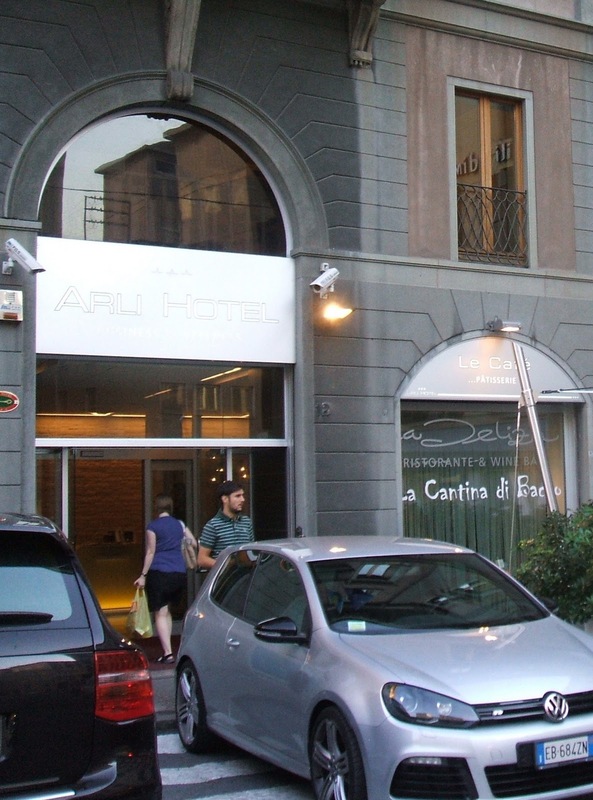 The comfortable Arli Hotel provides an ideal base for exploring the city. Situated in Largo Porta Nuova in the Città Bassa, the hotel is half way between the railway station and the funicular station for the Città Alta and is close to bus stops, shops, bars and restaurants. 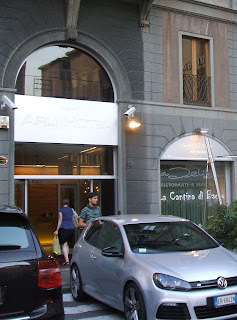 The Arli Hotel has a bright, welcoming reception area, which leads into La Delizia restaurant. There is also a dedicated internet room on the ground floor. There is a lift to the 66 bedrooms and guests can opt for single, double or king size accommodation. The Arli has a wine bar and guests can use the facilities of its Fit and Well Spa. Room service is available after 10.30 pm for late arriving guests. 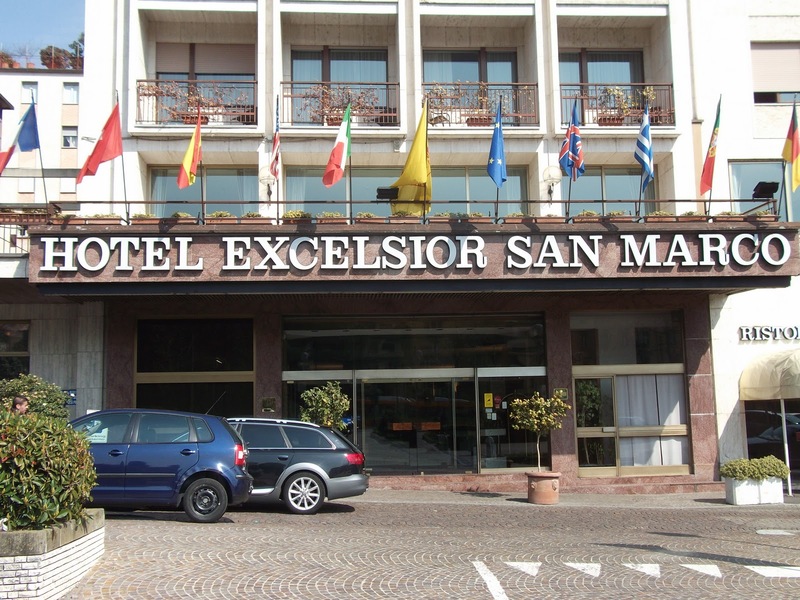 The handy position of the Hotel Excelsior San Marco makes it a good choice for a short break in Bergamo. The four star hotel in Piazza Repubblica is close to the station for the funicular railway linking the Città Bassa (lower town) and the Città Alta (upper town). It is also near stops for the number 1 bus service that runs from the Città Alta to the railway station and Bergamo’s Caravaggio International Airport. The hotel has 155 rooms, either standard, superior, deluxe or suites, all with satellite television and minibar. Guests can linger over the generous buffet breakfast served in the first floor restaurant while enjoying a bird’s eye view of Bergamo’s 450-year-old city walls, the towers and cupolas of the Città Alta and the mountains in the distance. 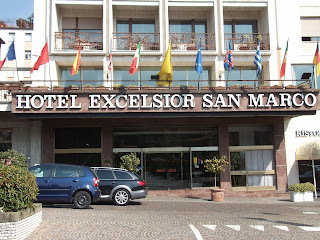 The Hotel Excelsior San Marco is set back from the main street, Via Vittorio Emanuele II, at a comfortable distance from the traffic. There are smart bars, restaurants and shops nearby in Piazza Repubblica, but Via Sentierone and Porta Nuova in the elegant centre of the Città Bassa are only a short walk away. The Mercure Bergamo Palazzo Dolci is situated in an old palace on the corner of the Via Paleocapa in a good, central position, a few metres from the railway station. The hotel is furnish- ed in a contemporary style. It has a bar and offers room service for hot dishes and cold snacks. The 88 rooms all have satellite television and mini bar. Wifi internet connection is extra. Guests can pay for either private indoor or private outdoor parking. In a handy location close to the historic Piazza Pontida, the smart Petronilla Hotel occupies a 19th century palazzo. The hotel building in Via San Lazzaro dates back to 1853 but inside the Petronilla has a modern, uncluttered décor and colourful, contemporary furniture. There are 22 guest rooms, some of which have balconies, walk-in wardrobes or jacuzzi tubs. The Petronilla also has a wellbeing and relaxation room with gym equipment and a sauna. Guests can sit and relax in either the lounge or the courtyard garden and there is wifi access throughout the hotel. Petronilla Hotel is in the quiet neighbourhood of Borgo San Leonardo, but is within walking distance of Porta Nuova and stops for the buses that run between the Città Alta and the railway station and Bergamo Caravaggio Airport at Orio al Serio. Guests can also walk in just a few minutes to nearby Piazza Pontida, where there is a good choice of shops, bars and restaurants. And by leaving the square along Via Sant’Alessandro it is possible to walk up the hill to Porta San’Giacomo, one of the gates into the Città Alta. This small Bergamo B & B is handily sitauated in the quiet cul de sac of Via Francesco Baracca off Via Nazario Sauro in the Città Bassa. Although Accademia Cararra is currently closed for restoration, some of its masterpieces can be viewed in a special exhibition on the top floor of Palazzo della Ragione in the Città Alta. Or you could walk down Via Pignolo into the heart of the Città Bassa and see masterpieces by Lorenzo Lotto in the churches of San Bernardino, Santo Spirito and San Bartolomeo on the way. The B & B Accademia has a smart modern décor and all rooms have free wifi and televisions with satellite channels. It is also only a short walk from the Hotel San Giorgio to the Città Bassa’s main thoroughfare Viale Papa Giovanni XXIII where there are bus stops for the Città Alta (upper town) in one direction and Bergamo Caravaggio airport at Orio al Serio going the other way. But there is free parking for guests with cars at the hotel, which is handily placed for access to the A4 Milan – Venice autostrada. The Hotel San Giorgio is in a converted 18th century building that has been furnished in modern style with smart bedrooms and bathrooms. Guests can use the free wi fi and watch television in the comfort of their own rooms. The NH Hotel is less than a kilometre away from Caravaggio (Milan Bergamo) airport at Orio al Serio in Via Portico and also handy for the Orio centre, Europe’s third largest shopping centre. Either standard rooms or junior suites are available. There is a restaurant and a choice of bars. Meeting rooms are available for the use of business travellers. Other facilities include a fitness centre, sauna and gym. 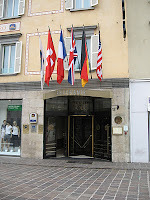 The NH Hotel is about four kilometres from the centre of Bergamo. The Starhotels Cristallo Palace is in a good location, three kilometres from Caravaggio (Milan Bergamo) airport at Orio al Serio and one kilometre from the railway station in the Città Bassa (lower town). Although it is a modern building, the rooms are furnished in traditional style inside. The restaurant serves an American-style buffet breakfast and there is a free shuttle bus into the centre of Bergamo. The UNA Hotel offers either a shower-sauna or hydro massage bath in the bathroom of all of its 86 spacious rooms and has a fitness centre. The restaurant serves both Bergamo specialities and international cuisine. The UNA Hotel is a modern building with meeting rooms designed for business travellers and is handily located three kilometres from the airport and two kilometres from the railway station in the Citta Bassa. 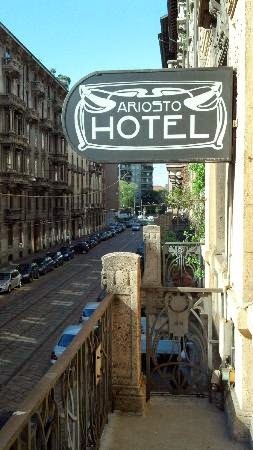 The Hotel Ariosto is housed in a liberty-style building that has been completely renovated to provide modern comforts. The hotel is near the church of Santa Maria delle Grazie where Leonardo da Vinci painted his largest and most famous work in the refectory of the convent. It is also handy for the Castello Sforzesco, the Cadorna railway station, a metro stop, a tram stop and the Corso Vercelli shopping area. The rooms either look out over an inner courtyard or at the decorative facades of the palaces opposite in the Via Ariosto. All have satellite television and wi-fi connections and guests have the choice of either a room service breakfast or the buffet breakfast served in the restaurant. The banks of i Navigli, Milan’s ancient canal network, have now become a lively area full of art galleries, antiques shops, restaurants and bars. During the summer, Naviglia Grande is the location for an antiques market on some Sundays. Milan’s canals date back to the 12th century. They were used to ship marble into the city while the Duomo was being built in the 14th century and continued to be used till as recently as the 1970s to bring in sand and gravel. Now the Milanese enjoy walking along the banks of the canals by day and visiting the night spots in the area after dark. For anyone wanting to stay in the area, the Ca Bianca Corte del Naviglio is in an ideal location in Via Lodovico il Moro, which runs alongside Naviglio Grande. It is a short walk from Porta Genova, or you could take the tram from outside the station to a stop just 50 metres from the hotel. Located in an historic building, the Ca Bianca Corte del Naviglio has a pleasant courtyard and garden to relax in as well as its own bar and restaurant. 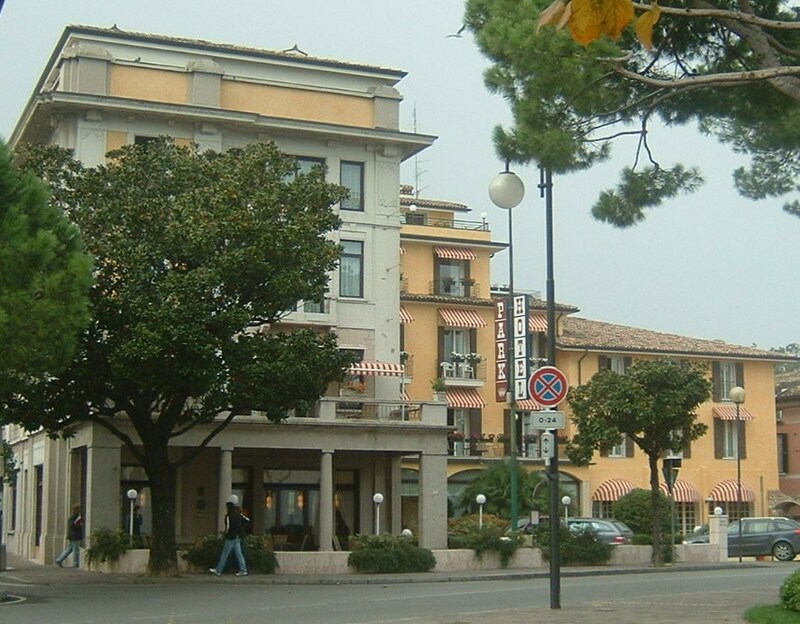 The Park Hotel has romantic views over Lago di Garda (Lake Garda) and is in a peaceful location. It is furnished in traditional style with some antique pieces and is set in well-tended gardens on the Lungolago Cesare Battisti, which runs alongside the lake shore. The hotel has 45 superior and 12 junior suites equipped with satellite television, mini bar and internet point. The hotel also provides car parking, room service, an indoor swimming pool and hydromassage baths. The hotel restaurant looks out over the lake and serves a rich buffet breakfast. It also offers lunch and dinner menus that include Lombardian specialities and local produce, such as fish from the lake. 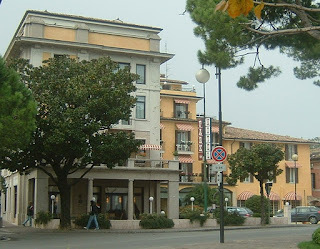 This hotel is in a good position in Bardolino, not far from the side of the lake. The three star, family run Hotel Quattro Stagioni, which has been recently renovated, is in Borgo Garibaldi in the oldest part of Bardolino. It has a pretty garden, a swimming pool and its own wellness centre. Four generations of the Arietti Manara family have run the Hotel Quattro Stagioni and they say that they pride themselves on providing guests with a warm welcome and on paying attention to even the smallest details. The Hotel Belvedere looks out over Lake Garda and guests enjoy the wonderful views from its balconies. The family run hotel is in the Porto Galeazzi area of Sirmione, close to a small harbour and a public beach. The hotel has wireless internet access and all bedrooms have private bathrooms, television and mini bars. The Hotel Luna is in the historic centre of Sirmione and is in a good position for enjoying the bars, restaurants and other amenities, while still being close to the lakeside. The Hotel Luna has wireless internet access and its own restaurant, which serves a buffet breakfast as well as offering lunch and dinner. There is a pleasant garden and the Hotel Luna offers free parking to guests. Despite its name, the Hotel Moderno is housed in an historic building and has been run by the same family for more than 100 years. There are panoramic views of the lake from many of the 24 rooms in the hotel, which all have wi fi internet access. The hotel is located conveniently close to the medieval centre of Lovere and has its own restaurant, which serves fish from the lake and local specialities, as well as a more international cuisine. The Hotel Sebino is at the side of the lake and has 25 rooms, many with wonderful views over Lago Iseo. The hotel has been converted from a former convent that dates back to about 1400 and has an elegant restaurant, Il Chiostro, which has been established in the old cloisters. A buffet breakfast is served in the breakfast room but the hotel also offers room service. 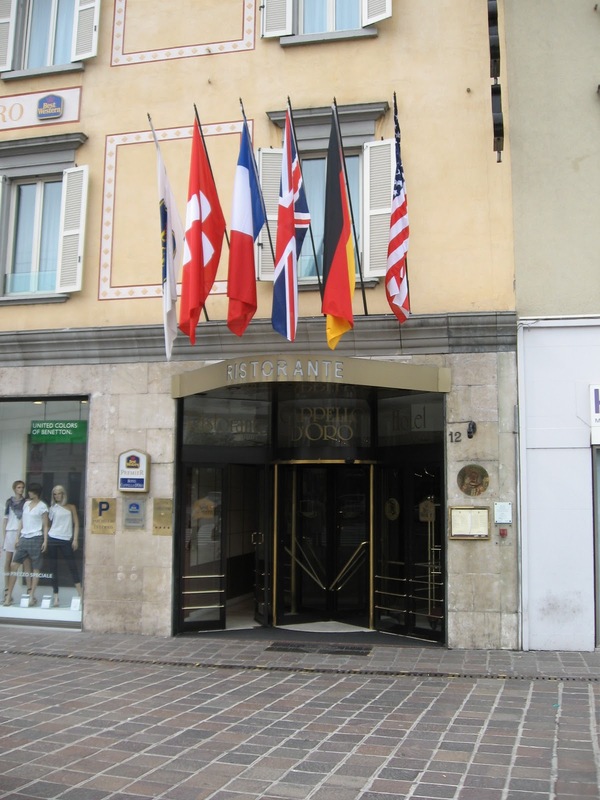 The Hotel Meublé Orologio makes a good base in Brescia as its location in Via Cesare Beccaria is close to the main square, Piazza della Loggia, and only a few minutes walk away from the renowned Santa Giulia museum. There is a distinct Venetian influence in the architecture of Piazza della Loggia, which is in the centre of the town and is the site of the main Ufficio d’Informazione Turistiche (tourist information office). It has a clock tower remarkably similar to the one in Saint Mark’s square in Venice .The Santa Giulia Museo della Citta covers more than 3000 years of Brescia ’s history, housed within the Benedictine Nunnery of San Salvatore and Santa Giulia in Via Musei. The nunnery was built over a Roman residential quarter but some of the houses, with their original mosaics and frescoes, have now been excavated and can be seen while looking round the museum. The hotel is housed in an historic building but has plenty of modern facilities. Guests can enjoy their breakfast on a terrace with panoramic views of the city. Although it is in a quiet location at the side of the lake, the Hotel Giordano is only a short walk from the historic centre of Lecco and the shops and restaurants. In a good position on Lungolario Luigi Cadorna, the hotel has some rooms that overlook the lake with terraces so that guests can sit out and enjoy the stunning views. All the rooms have a television, minibar and internet connection. All recommendations are made in good faith and details have been based on information provided by the hotels.